In the information exchange meeting at the 8th Tohoku ART Seminar held on August 17, 2012, Prof. Masakuni Suzuki, Director of Suzuki Memorial Hospital offered words of encouragement. Prof. Suzuki is the former teacher of the clinic director, Koichi Kyono, and was the first to achieve a successful pregnancy and childbirth by in-vitro fertilization in Japan. In the field of assisted reproduction technologies (ART), Professor Emeritus Robert G. Edwards of Britain was the first to successfully achieve pregnancy and childbirth by in-vitro fertilization (IVF) in 1978. However, even before the birth of Louise Brown, the world's first IVF baby, Japanese researchers, including our team in Tohoku University, were working hard to achieve the same goal. In 2010, 32 years later, Professor Emeritus Robert G. Edwards won the Nobel Prize for Physiology or Medicine. As previously mentioned, our team in Tohoku University was one of the teams working towards the development of reproductive medicine, along with doctors from all over the world, senior researchers and our co-workers. In 1983, our team successfully achieved pregnancy and childbirth by in-vitro fertilization for the first time in Japan. Dr. Kyono was part of this team in his younger days. As today, Dr. Kyono worked very hard in the lab, and contributed greatly to the research. As a specialist in Assisted Reproductive Medicine, Dr. Kyono has carried out a wide range of research and published many papers. I am really happy that he plays an active role in ART, not just as a leading doctor in Japan, but in the world. Up to now, Dr. Kyono has based his practice in Sendai. However, reflecting on his experience in the Great East Japan Earthquake, he decided to open a new clinic in Tokyo, taking into consideration the importance of having multiple bases for treatment. I am sure Dr. Kyono will continue his dedicated effort in the development of reproductive medicine, even more zealously than before. As an expert in American-style in-vitro fertilization, Dr. Takumi Takeuchi, Clinic Director, is highly recommended. 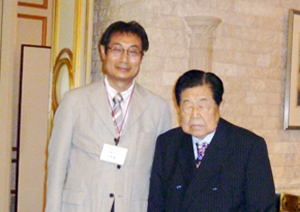 Dr. Takeuchi graduated from the Department of Medicine, Gunma University in 1987. He completed his medical internship at the Department of Obstetrics and Gynecology, majored in in-vitro fertilization at the Graduate School, and graduated with excellent achievements. He then studied at the Cornell University Hospital (Manhattan, New York) ranked No. 1 in the United States for in-vitro fertilization. He joined Prof. Rosenwaks' lab, which achieved the first successful in-vitro fertilization in the United States. Under the guidance of Prof. Palermo, who successfully performed the world's first micro fertilization (male infertility treatment where sperm is injected into an egg under a microscope), Dr. Takeuchi participated in reproductive medicine for 11 years, and performed micro fertilization for more than 5,000 patients. In recognition of these achievements, he was appointed as an Assistant Professor at the Department of Obstetrics and Gynecology, Cornell University. He is a seasoned veteran doctor in in-vitro fertilization. It is an honor to receive treatment from such an expert in infertility treatment.